There are few things more beautiful than a public library — a shared community space that encourages study, reading books and borrowing information — such fountains of free knowledge greatly improve our society and our world. Recently many small libraries have been springing up in somewhat unexpected places, from local public parks and urban sidewalks to city phone booths. This small library is part of Colombia’s Paradero Para Libros Para Parques, a program created ten years ago to help promote literacy. In Bogotá nearly fifty tiny Paradero Para Libros Para Parques libraries have been created as part of their Fundecultura program, a joint partnership with local parks which aims to improve the public’s reading and writing skills. 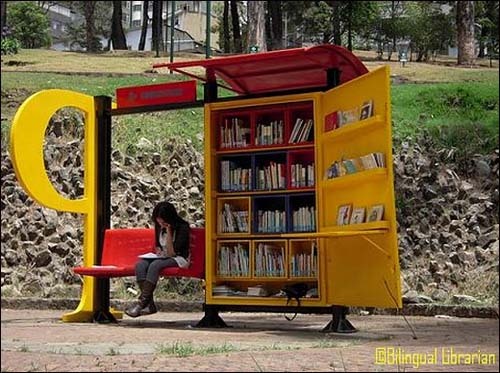 Colombia has built over a hundred of these little free libraries in different neighborhoods across their country. Each one is staffed by a volunteer for about twelve hours a week, who answers questions, checks out books, and also helps children with their homework. 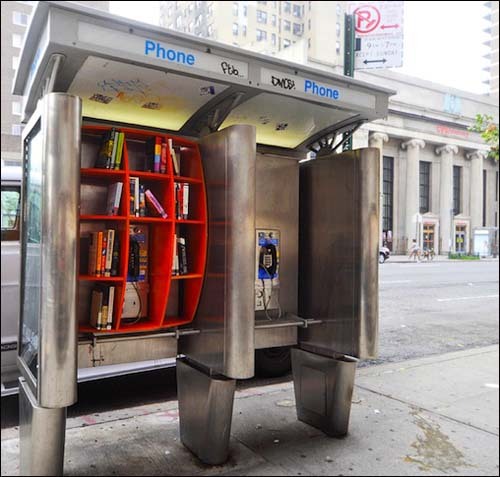 Perhaps inspired by the extensive Occupy Wall Street library, in New York city architect John Locke’s goal was to reinvent the increasingly obsolete phone booth as a new kind of public space. This free mini library is located near 96th Street; it is made of plywood, and is stocked with a variety of books donated by local residents. 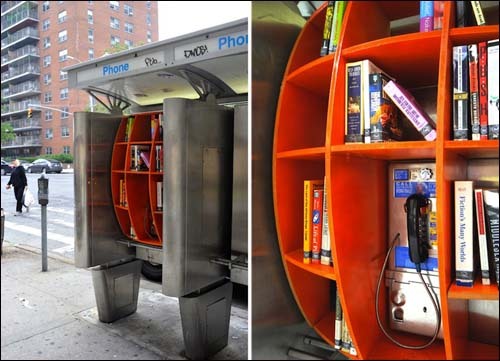 This NY phone booth has been turned into a mini library by architect John Locke. These clever and simple ideas help reshape our collective public commons in beautiful positive new ways that promote not only reading and education, but also sharing and a stronger sense of community. Even in our increasingly online digital age, printed books and public libraries will continue to flourish.